They have risen again. Nearly 15 years ago, the Universal Monsters saw a resurrection from the grave with the introduction of Classic Monster Postage Stamps. The stamp collection prompted the release of Universal Monster figures from a major toy studio – Hasbro – and eventually led to the impressive Sideshow Toy line of figures.Now, they’re back. Two major toy companies have the license and will be producing some great toys over the next few years. The first, of course, is Diamond Select, which secured the license from Universal a few years back. Since that point, Diamond has been issuing two Mego-style Monster figures in their “Retro-Cloth” series and three PVC Monster action figures every Halloween, along with a selection of Mini-Mates and alternative sculpts. All of those lines are going to continue into the foreseeable future. This year, Diamond will release two new “Retro-Cloth” figures: The Bride of Frankenstein and the hotly anticipated Creature from the Black Lagoon. The 2012 PVC figures include The Phantom of the Opera and Metaluna Mutant from This Island Earth. The 2012 Mini-Mates include The Mummy and The Hunchback of Notre Dame. 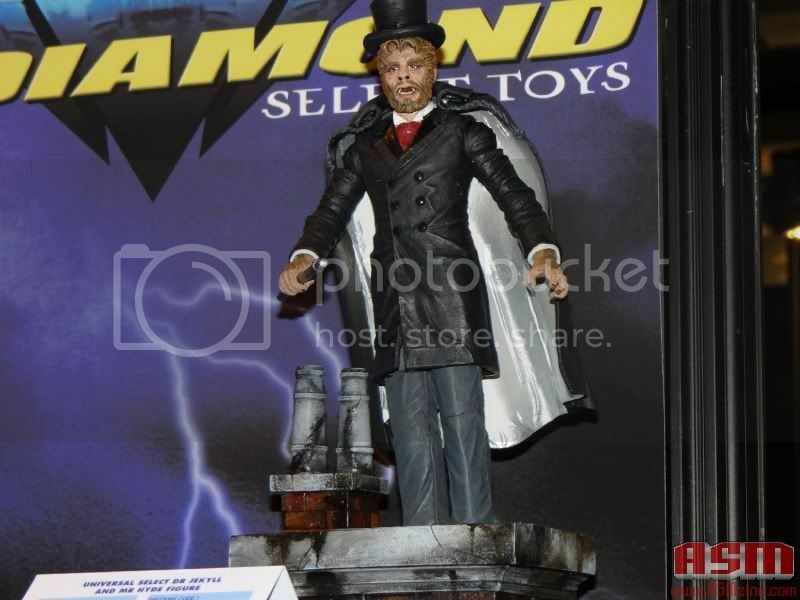 In 2013, Diamond will release new PVC action figures: The Hunchback of Notre Dame, The Mole People and a Boris Karloff Dr. Jekyll and Mr. Hyde. Diamond is also planning on releasing a Frankenstein Bust Bank. This year, Mezco also secured a Universal license and will be producing some terror-ific looking pieces. They will be releasing three stylized figures of The Mummy, Frankenstein and The Creature from the Black Lagoon. In addition, they will be releasing the Universal Monsters in their Living Dead Dolls series. The first two will be Dracula and Frankenstein, both of which will be released in 2013. The final product from the upcoming assortment will be a “Big Frankie” version of their stylized Frankenstein figure. Finally, Diamond will also be producing new Munsters figures, in addition to “Silver Screen” versions of the first series. It seems as if, in the world of Universal Studios Classic Horror, there is one sequel which gets all of the attention – The Bride of Frankenstein. Granted, it deserves all of the admiration it receives – and more! But, there are other follow-up films in the Universal canon that are wonderfully-made which also are owed a great deal of respect. Perhaps the most under-appreciated is Dracula’s Daughter. A direct sequel to Dracula, the movie begins just moments after the original ends. Two bumbling policemen stumble upon the body of Renfield in the basement of Carfax Abbey, where they also meet a very much alive Professor Van Helsing (credited as “Von Helsing”). Admitting to driving a stake through the heart of the evil Count, Van Helsing is arrested for murder and seeks the aid of a trusted friend, Jeffrey Garth. Garth, a psychiatrist and former student of Van Helsing, must help the professor prove that Van Helsing did not murder anyone, that Dracula was indeed already dead for 500 years – a seemingly impossible task. But, when the body goes missing and London is once again rife with bloodless corpses, proving Van Helsing’s innocence becomes a tad bit easier. The film stars Gloria Holden in the title role. Playing Countess Marya Zaleska, Holden definitely holds a candle to Bela Lugosi’s performance in the previous film, channeling his eerie presence in nearly every scene. It’s hard to imagine any actress but Holden being able to utter, in such genuinely distant fashion, the famous line, “I never drink… wine.” Like Lugosi, Holden commands the screen. Everything about her is eerie, foreign, intriguing, seductive, and just plain creepy. Her motivations are also the most complex of any early Horror character. A reluctant vampire who loathes the control Dracula still exerts over her, even from the grave, Countess Zaleska seeks psychiatric “release” from the curse of the vampire, yet still embraces her father’s evil ways. The film is very much in keeping with the style of the original, using the same sets for Dracula’s Castle, carrying over Edward Van Sloan as Professor Van Helsing, referring frequently to characters and situations in the original, and even lifting lines (and a camera shot) from the 1931 classic. Dracula’s Daughter really is a terrific sequel. The intended parallels between this film and the original work wonderfully. The only thing that drags the film down is its uneven pacing and its tendency to dwell too much on the comedic relationship between Dr. Garth and his secretary. But, for every fault in the film, there are ten positive things which work to its advantage. In addition to the great performances by Holden and Van Sloan, the film’s music is atmospheric, moody, and chilling. The theme, used in the opening and during the climax, is one of the best, if not the best, in the Universal Horror repertoire, rivaling the main theme of The Wolf Man as the most sweepingly tragic, dark and elaborate piece of music in the early history of Horror. While the sequel could have taken any number of directions, and it almost took a very weird one with James Whale helming the first efforts, this film is very enjoyable for what it is. It could have starred Bela Lugosi. It could have had Van Helsing be the main hero. It didn’t. And, as such, it should be judged on its own merits – and it has plenty. Perhaps, one day, fans of the genre will come to realize this and bolster Dracula’s Daughter to its rightful place in the Universal library – not being nearly as good as The Bride of Frankenstein, but deserving a lot more credit than some of the later Dracula and Frankenstein sequels. Overall, the film earns a solid 4 out of 5 stars.